Since its inception, the event has added 16 regional qualifying competitions along with international competitors, undergone some rule changes, attracted additional sponsors, and now includes a LIVE web stream of the National Event to gain world-wide coverage. The formula has worked. Today the event is the World of Concrete/World of Masonry’s single greatest attraction drawing as many as 4,000 or more spectators and watched by as many as 7,000 internet viewers every year. In general description, the SPEC MIX BRICKLAYER 500 National is a bricklaying competition comprised of the best bricklayers and mason tenders, qualifying through different regional contests held across North America, to decide, “Who is the World’s Best Bricklayer?” Twenty, 2-man teams made up of a mason and mason tender compete to lay the most bricks while meeting strictly defined quality standards. Teams have 60 minutes to complete their 26-foot 8 inch, double wythe brick wall while 20 judges evaluate their workmanship. The competition has four separate awards: 1st, 2nd, and 3rd place are based on the highest net brick count. Judges add up the brick laid and subtract from the count if there are quality violations. The record amount of brick laid by a mason in this competition was set by Garrett Hood in 2010 with a total of 911 brick. The 4th award, the SPEC MIX TOP CRAFTSMAN® is for the most sellable (best constructed) wall with over 500 brick installed. This award is the second most coveted award at the event, and has the second highest award purse. The final award given at Nationals is the SPEC MIX TOUGHEST TENDER® which pays the winner $2,500. Truly an ironman style event that separates the men from the boys, the SPEC MIX TOUGHEST TENDER is a preliminary event held just before The SPEC MIX BRICKLAYER 500 National. In this event the tenders race the clock to set up a predefined work area for the mason while following strict instructions to ensure accuracy. The record winning time in this event was set back in 2005 by Felipe Reyes of Connecticut with a time of 11 minutes, 7 seconds. 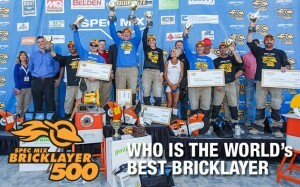 The SPEC MIX BRICKLAYER 500 National has the largest winner’s purse of any masonry competition with over $100,000 in cash and prizes awarded to the competitors. The top prize for 2011 is a new FORD F-250 4×4 XLT Crew Cab truck. Anyone in the masonry trade knows they are the torch carrying successors of a craft with a long-standing reputation that is loaded with integrity, pride and commitment to quality. Above all objectives, the SPEC MIX BRICKLAYER 500 is one way SPEC MIX and its sponsors can give testament to the passion of every person on a masonry job site. If there is such a thing as a “labor of love,” hosting the SPEC MIX BRICKLAYER 500 is a responsibility that takes the cake for the SPEC MIX crew and we are very thankful for everyone’s contribution to this successful program.